Don't count out the Huntington Park dining scene, because Nina's Cafe might be singlehandedly putting it on the map. This cute, cozy, and classy hidden gem is better than your average hipster joint. WHEN: Year-round, open 'til 10 P.M. PARKING: Neighborhood parking and street parking. The street parking has meters but the meters are super old...Use your best judgement here. We sent friends of Stuff in LA to check out Nina's Cafe after hearing some good things about it. This is their report back. The terms "hidden gem" and "jewel" and "hole in the wall" seem to be thrown around a lot these days, so it's tough to really try and sort through the junk and see what really fits them as accurate. We can confidently say that after visiting Nina's Cafe for ourselves that it is indeed a hidden gem and indeed a jewel and indeed a hole in the wall. Interestingly enough, Huntington Park is never really mentioned when people talk about all the awesome places to eat in LA. It's kind of just drowned out by spots directly in DTLA (Huntington Park is a few miles south), in West LA, in the South Bay, and so on. However, that doesn't mean that there aren't good restaurants there. Nina's is proof. When we arrived, we noticed that the parking is kind of sparse. We're saying that because Nina's Cafe is literally on a corner of a major street down the way from Gage Elementary School. We had to kind of just get lucky and find a street meter parking nearby, and it was kind of odd since it looked like no one--except for one car--on the block put any money in the meter. Mind you, this was around dinner time, so maybe it wasn't enforced, but the street signs made no mention of parking hours other than random hours you can't park there due to street cleaning. The exterior looks somewhat shabby, so we were a bit worried that the interior would kind of match that. We mean, that's not really a problem, but everything we heard was that Nina's was so cool and that the atmosphere was a part of it. Fortunately, the interior is simply awesome! It's a pretty small space, but there is easily enough room to sit 20-30 people. Firstly, it's fairly dark but still has enough lighting to see the person across from you. There was also some hip music playing over the speakers, but it was quiet enough to break the silence but also not loud where you have to scream. Interesting classic art were over the walls along with several decorations that really made Nina's feel very hip yet comfortable; the most prominent of which was an absolutely humongous "LOVE" spelled out of flowers on the wall. The staff all were friendly and sat us right away. Let us tell you--the staff is super accommodating and friendly here! They really were on the ball when it came to service and when it came to making us feel sure we were welcome there. We really appreciated that and we know you will too. In fact, we asked an employee—we later found out it's Chef David from Guatemala who opened Nina's Cafe—if the street meters were enforced, and he kind of just waved his hand and said to not worry about it. He could tell we were kind of worried and said he would alert us if he saw a parking enforcer. Now that's service! The menu here is really great. 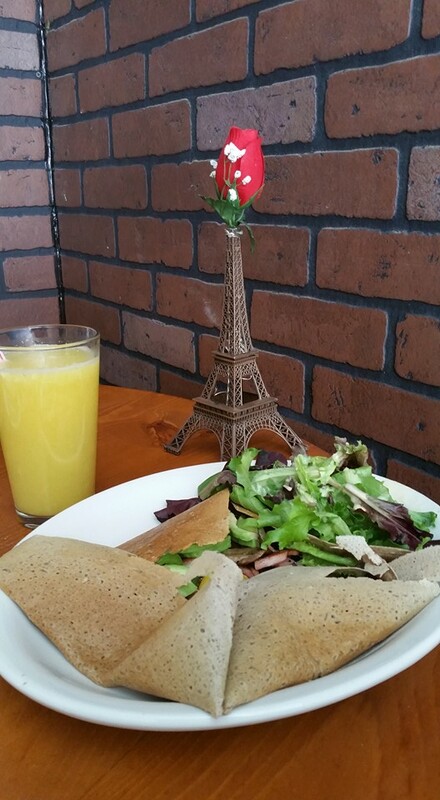 There are tons of sweet and savory crepes for all meals, and there are plenty of delicious salads and sandwiches and pasta. We got the goat cheese turkey sandwich--simply an amazing dish with awesomely seasoned fried potatoes on the side--along with some pasta. We also got a strawberry smoothie along with a banana smoothie, and when we tasted them, we immediately knew that real fruit went in--not some weird concentrate fruit! Extra bonus. Overall, Nina's Cafe is simply a really awesome and inexpensive place to eat in Huntington Park. It's probably one of our favorite hidden gem restaurants in all of Los Angeles, to be honest with you. You simply can't go wrong with ACTUALLY GOOD FOOD (we want to emphasize this point--it was good! ), great service, and an awesome atmosphere. Definitely check it out and tell 'em Stuff in LA sent you!